With the growth of 3D printing, it’s entirely possible to 3D print your own prosthetic from models found in open-source databases. But those models lack personalized electronic user interfaces like those found in costly, state-of-the-art prosthetics. Now, a Virginia Tech professor and his interdisciplinary team of undergraduate student researchers have made inroads in integrating electronic sensors with personalized 3D-printed prosthetics — a development that could one day lead to more affordable electric-powered prosthetics. This newly published research out of the lab of Blake Johnson, a Virginia Tech assistant professor in industrial and systems engineering, took a step forward in improving the functionalities of 3D-printed personalized wearable systems. By integrating electronic sensors at the intersection between a prosthetic and the wearer’s tissue, the researchers can gather information related to prosthetic function and comfort, such as the pressure across wearer’s tissue, that can help improve further iterations of the these types of prosthetics. The integration of materials within form-fitting regions of 3D-printed prosthetics via a conformal 3D printing technique, instead of manual integration after printing, could also pave the way for unique opportunities in matching the hardness of the wearer’s tissue and and integrating sensors at different locations across the form-fitting interface. Unlike traditional 3D printing that involves depositing material in a layer-by-layer fashion on a flat surface, conformal 3D printing allows for deposition of materials on curved surfaces and objects. According to Yuxin Tong, an industrial and systems engineering graduate student and first author of the published study, the ultimate goal is to create engineering practices and processes that can reach as many people as possible, starting with an effort to help develop a prosthetic for one local teen. “Hopefully, every parent could follow the description from the paper we published and develop a low-cost personalized prosthetic hand for his or her child,” Tong said. To develop the prosthetics integrated with electronic sensors, the researchers started with 3D scanning data, which is similar to taking pictures at various angles to get the full form of an object — in this case, a mold of the teenager’s limb. 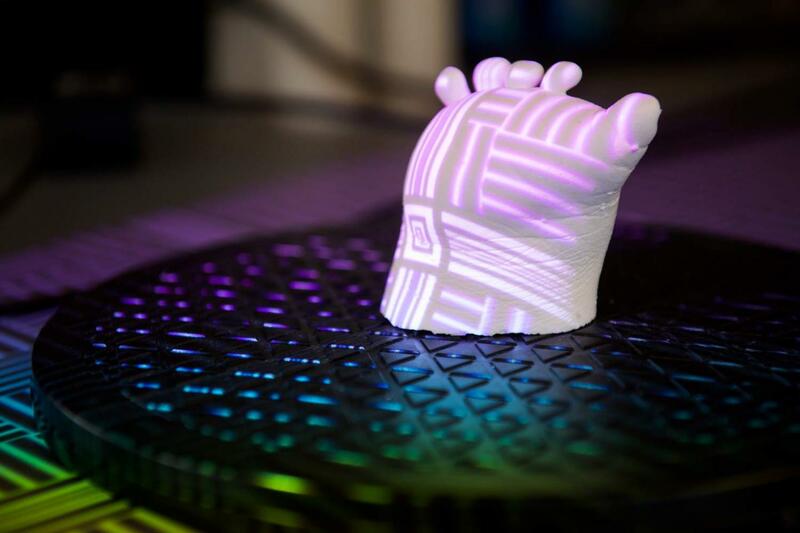 They then used 3D scanning data to guide the integration of sensors into the form-fitting cavity of the prosthetic using a conformal 3D printing technique. The process developed by the research team will lend itself to further applications in personalized medicine and design of wearable systems. “Personalizing and modifying the properties and functionalities of wearable system interfaces using 3D scanning and 3D printing opens the door to the design and manufacture of new technologies for human assistance and health care as well as examining fundamental questions associated with the function and comfort of wearable systems,” Johnson said. Johnson’s research into prosthetic hands was inspired when he learned about his colleague’s daughter, Josie Fraticelli, then 12-years old, who had been born with amniotic band syndrome. While in utero, the development of her hand stopped. String-like amniotic bands restricted blood flow and affected the development of right hand, causing a lack of formation beyond the knuckles. Johnson used his related research expertise in additive biomanufacturing and a team of interdisciplinary undergraduate researchers to 3D print the bionic hand for Fraticelli that would become the basis of the now-published research. As they worked with Fraticelli, they continued tweaking the prototype prosthetic by developing new additive manufacturing techniques that would allow for a better fit to Fraticelli’s palm, creating a more comfortable, form-fitting prosthetic device. They validated that the personalization of the prosthetic increased the contact between Fraticelli’s tissue and the prosthesis by nearly fourfold as compared to non-personalized devices. This increased contact area helped them pinpoint where to deploy sensing electrode arrays to test the pressure distribution, which helped them to further improve the design. Sensing experiments were conducted using two personalized prosthetics with and without sensing electrode arrays. By running these experiments with Fraticelli, they found that the pressure distribution was different when she relaxed her hand versus holding her hand in a flexed posture. Overall, Fraticelli does feel that the new personalized prosthetic improves her comfort level. Since her hand is soft and changeable under different postures and the prosthetic material is rigid and fixed, the level of conformity may continue to change. Personalized prosthetics still have space for improvements, and Johnson’s team will continue to research and develop new techniques in additive manufacturing to make improvements on wearable bionic devices. This research was supported by the National Science Foundation (Division of Undergraduate Education) and by Virginia Tech’s Student Engineers’ Council; Computational Tissue Engineering Interdisciplinary Graduate Research Program; and Institute for Creativity, Arts, and Technology.